Stravinsky's The Rake's Progress, latest in Vladimir Jurowski's Stravinsky series at the Royal Festival Hall with the London Philharmonic Orchestra. Given that Jurowski's Rake's Progress at Glyndebourne is a classic, this semi-staged concert performance was an excellent opportunity to revisit the piece, focusing more acutely on the opera as music. This was an excellent performance, orchestrally, bringing out the restraint in Stravinsky's orchestration, not so much "neo-classical" as baroque. The harpsichord (Helen Collyer) was positioned between orchestra and soloists, reinforcing baroque sensibilities and the notion of opera as moral allegory. Although W H Auden wrote the libretto, his reference was Hogarth's series of paintings The Rake's Progress (1732-4), and the series of etchings printed for mass circulation in the following years, from which David Hockney drew his inspiration for that iconic Glyndebourne production. Thus the stylization in the opera, playing with many concepts on many levels, at once black and white yet ambiguous. Auden's text is elegantly convoluted, its literary eloquence deliberately masking the horror in the story, so those who'd prefer not to think past the hard, brittle surface may come away thinking that it's arch comedy. And laughs there are, but not always nice. 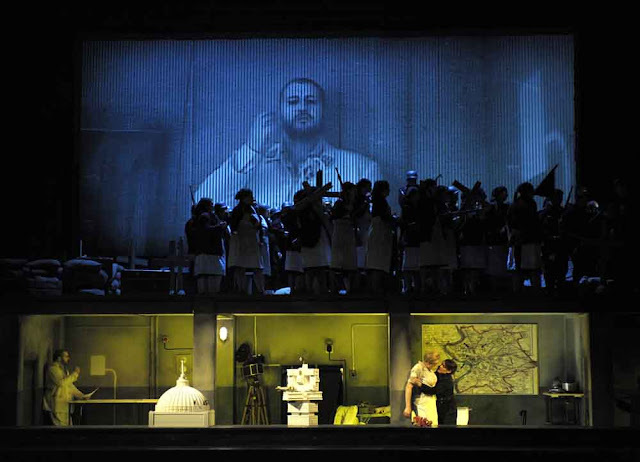 What might seem moral just might not be : everyone in this opera is compromised in some way, apart from Baba The Turk, who is, significantly, the outsider. Matthew Rose reprised the role of Nick Shadow as he did in 2011, adding also the Keeper of the Madhouse, which was a wise choice, since arguably, Nick Shadow, like the Circus Master in Alban Berg's Lulu , pulls the strings in a zoo where people are animals. Toby Spence sang Tom Rakewell, with Sophia Burgos as Anne Trulove, with Clive Bayley reprising the part of her father. Andrew Watts, standing in at 24 hours notice as Baba the Turk, almost stole the show, however, with a camp but extraordinarily sensitive interpretation of the role. Kim Begley sang Sellem the Auctioneer and Marie McLaughlin sang Mother Goose. The stage platform was arranged so that the orchestra and chorus (London Voices) were close to the back wall, leaving a lot of empty space in front, to give the singers room to move (rather than teetering over the edge as is usually the case). But this, combined with the surprisngly non-capacity audience, muffled the singing to some extent, to the disadvantage of the less-dominant voices. Rose carried the performance through most of the First Act, but Watts's entry seemed to galvanize proceedings. Perhaps the echo in the hall worked against clear diction, other than from the principals , as some in the audience complained, which was a pity since Auden's texts are poetry, to be savoured even without Stravinsky's coiling lines, stretched vowels and spiralling cadences, oddly reminiscent of Benjamin Britten, whose work Stravinsky must have known by 1951. Tom's descent to debauchery is conventional enough - shades of Faust and Mephistofeles here, and in the card game towards the end, of Stravinsky's The Soldier's Tale, and even sly allusions to Tannhäuser and Venusberg - all of these part of the cavalcade unfolding on many levels and many forms. But where does Baba The Turk fit in with this Faustian adventure ? What kind of creature is she/he and how does she/he change the narrative ? She/he's first heard of when Nick Shadow shows Tom a broadsheet from a travelling show she stars in. He's aghast but Nick taunts him "For he alone is free, who chooses what to will and wills his choice as destiny". So Tom marries her to prove he's free, but ends up more tied than before. Although the role is often taken by a woman, (Patricia Bardon, who was originally scheduled, has done the part very well many times before), having a countertenor adds extra frisson, in addition to underlining the baroque connections. 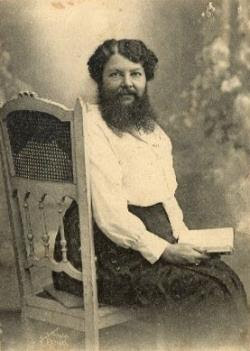 Baba's a bearded lady, and exotic as all "Turks" are supposed to be. Watts appeared, spotlit and veiled, mincing in stilettos, transforming the opera and performance. Wonderfully, flamboyantly androgynous ! Everyone else in these proceedings scams everyone else in some way, even Anne Trulove, whose "love" isn't truly altruistic since she plays games of social convention. But Baba's on the level, giving up fame and fortune for a wastrel like Tom. All the others treat each other like commodities: Sellem the Auctioneer might sell objects, but these objects are symbols of lives gone wrong, people making money from the misfortunes of others. Even Baba becomes an object. "Old wives for sale". Tom winds up in the madhouse, babbling about Venus (Tannhäuser and creativity in the guise of woman). The opera resolves, like Don Giovanni, with a moral, where the main characters tell what they've learned. " All men are mad; all they say or do is theatre" (Baba) and "Beware, young men who fancy you are Virgil or Julius Caesar : Lest when you wake, you are only a rake". (Tom). And even Nick Shadow who acts like he's in control, but isn't. "Many insist I do not exist. At times I wish I didn't".